Helps promote absorption within the body, along with black pepper extract bioperine. 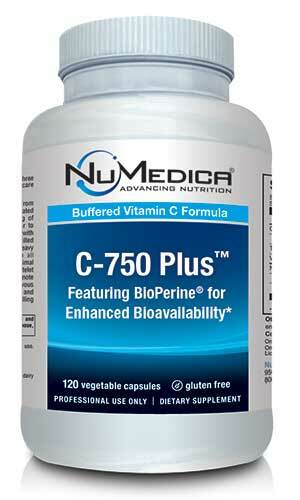 NuMedica C-750 Plus is designed to enhance the body's ability to absorb more vitamin C and obtain its important antioxidant protections. This vitamin-rich supplement contains 750 mg of buffered vitamin C, which is enhanced with the addition of bioperine, a natural black pepper extract that helps to improve the body's ability to absorb and use vitamin C efficiently and, ultimately, more effectively. Vitamin C is a major provider of antioxidant protection and also supports the body's health in many other ways. We all depend on vitamin C for optimum growth and development. Because vitamin C is a water-soluble vitamin, we don't have the ability to store it in our bodies. We have to use what comes along while any extra is flushed through the system. Because we can't store this vitamin, we need a continuous healthy supply of it to support growth and development, the maintenance of bones and teeth, to heal injuries, support the health of connective tissue, and to provide important antioxidant protection. 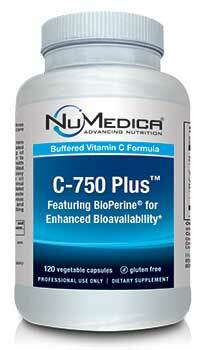 Because we may not eat foods that are rich in vitamin C each day, we can take a reliable natural supplement like NuMedica C-750 Plus designed to provide the vitamin C our bodies need. The vitamin C contained in NuMedica C-750 Plus provides integral antioxidant protection our bodies need to fight free radicals. Free radicals are associated with disease. Antioxidants eliminate free radicals, which supports our overall health and wellness. A diet rich in antioxidant protections helps our bodies fight off diseases like cancer, heart disease, and arthritis. Powerful antioxidants may even slow the aging process. Again, if we don't get the optimum level of antioxidant protection from our diet each day, NuMedica C-750 Plus can provide some of the protection we need to support our bodies' needs. Helps support immune system function, improve collagen production, and provide antioxidant protection with its blend of vitamin C and bioflavonoids.